Eulogy held a secret which, under normal circumstances, would have been public knowledge. However, her birth mother feared for Eulogy's safety and, as a result, put her up for adoption allowing her husband and firstborn son to believe that Eulogy had died at birth. In fact, Eulogy had been led to believe her natural mother had died giving birth to her - so the truth of Eulogy's birth was well kept for numerous years. However, just before Eulogy's adoptive mother passed on, which would leave her totally devastated and alone, the truth was finally revealed. Eulogy was eager to meet her brother and even set out to find him immediately - only to be turned away, which set the stage for the events which were to follow. Only moments after being shunned by her brother, she was nearly raped by a couple of ruffians on his property. Thankfully, Jack Huntley - her brother's arch enemy - happened by and prevented such an atrocious act from being committed. Even so, Eulogy did lose all of her documentation to support her birthright, as well as any funds she had, quickly finding herself at Jack's mercy. They developed a friendship, of sorts, with Jack looking out for her and stopping by to check on her as he had the opportunity. However, over time, he grew to care more deeply for Eulogy but, because of being heartbroken in the past, not to mention the difference in their social status, he was unwilling to be honest about his feelings. Knowing this social chasm existed between them and fearing Jack was unable to completely trust her, Eulogy was determined not to share the secret of her birth unless Jack could love her as the person he saw each day. 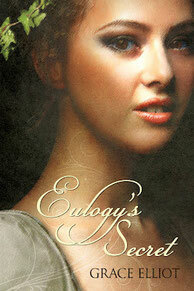 Eulogy's Secret is definitely a story of love and loss but it goes above and beyond. It's a story of feeling hope and demonstrating courage in the face of adversity, despite the odds stacked against a person. It even portrays what it means to find redemption - in the eyes of another and when facing oneself in the mirror. Finally, it's a story of granting forgiveness and providing a second chance, even at the risk of being hurt again. Grace Elliot has created solid characters and a memorable - if not timeless - story. It would be my honor, and privilege, to read her work again. If you would like to learn more about Eulogy's Secret, click on the book cover which will take you to its page on Amazon.